An intriguing tale of a holiday which leads to startling revelations, For Those Who Can Tell No Tales shows us that things are not always as idyllic as they seem on the surface. 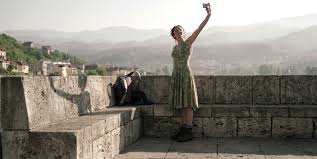 Jasmila Zbanic's latest film is extremely atmospheric and is a wonderful history lesson about a town which has seen and is trying to move on from the horrors of war as seen through the eyes of an Australian tourist. While the stories told are tales of sheer terror and extreme violence, it is the gorgeous cinematography which gives more of an emotional impact than the screenplay itself. Sydney sider, Kym (Kym Vercoe) decides that rather than take the road most travelled and head to Fiji for a summer holiday, she is going to take a tour of the Balkans starting with Sarajevo. While in Bosnia, she is inspired to travel to the town of Visegard and take the advice of her travel guide and stay at the Vilina Vlas Spa Hotel. Although the town seems idyllic and Kym enjoys her time, she experiences a night of extreme unrest and disturbing, unexplained anxiety during her stay there. It is only months later when she arrives back in Australia that she finds out about the extreme and violent horrors the town experienced during the Bosnian War and that the hotel which she stayed in was used as a war camp countless where women were raped and murdered. Determined to find out why the town chose to cover this up, she returns to Visegard in the winter. For Those Who Can Tell No Tales carries a huge weight as it deals with a horrific subject. The film doesn't show any of the horrors which it talks about, but rather uses it's haunting musical score and cinematography to create an atmosphere which allows us to feel the way Kym does about Visegard. The absence of the images or sounds of wartime Visegard means that the screenplay has to work even harder in order to support the emotional complexity of the film. The screenplay is by no means weak, but it doesn't make unsettle the way it could. While it is not emotionally strong, it is however intriguing and very interesting. It is a tale which many would not have heard, but one which many could relate to in a certain way. Countless people decide to take a trip of a lifetime and in their travels make spontaneous decisions based on what their guide book says, and with this in mind, what happened to Kym could happen to anybody without the internet as a research tool and is a rather distressing thought. She tries to find a peace with coming so close to the brutality of war without actually being there, and this is a legitimate way to feel. The film is very much like a piece of travel fiction with an investigative touch. What the film says about a town recovering from the horrors of war is particularly interesting. While Kym travels to Visegard to essentially find out why the citizens try to cover up what happened there, she is bringing up a past that many don't want to talk about and become angry at an outsider mentioning it. When Kym finds the author of the guide book, Tim and questions why he had recommended Vilina Vlas as a place to stay, he explains that Bosnia is trying to move forward and isolation is not the answer. Kym travels to Visegard first in the summer and becomes part of their celebrations and infectious happiness, and when she discovers the town's dark past she struggles to comprehend why they should seem so happy and not openly mourning. This shows that a town like Visegard does not want to dwell in it's past and wants to move to move into the future without having to be reminded about what they have been through. What the screenplay lacks in emotional impact, the cinematography makes up for. From the very first shots of Kym in her return journey to Visegard in the winter, you feel a strong sense of what it would really be like to be there and feel the way Kym is feeling. There is a completely different atmosphere in Kym's first journey than in her return journey. It is not just the season that has changed on the return trip, but also the way she feels about the town knowing it's past and this is not just seen, but felt through the way the town is shot. The musical score is also incredibly haunting. The scene where Kym is on the bridge and being photographed in exceptionally well done. It has an atmosphere of dread as the score is extremely sombre and the as the camera is pulled back from the bridge, the water looks deathly still below it and the bridge itself lifeless. The opening shots in the snow are exquisite, and again the bridge in the snow is a beautiful, but haunting vision. The use of the video diary is not as prominent as it could have been, and with the time it has been given blends confusingly into the use of the film's principal photography. Kym Vercoe does well to carry the whole film by herself. Her character is changed by her experience in Bosnia and she is eventually worn down by the burden she is carrying. She begins the film full of life and excitement, and progresses in the film to become angry with the world and distressed. It is a fine performance which deals more in the subtlety of her inner turmoil than exaggerated emotions. It is a role that could have had some stereotypical features of a woman out to somehow save and avenge the Bosnian women who had passed, but it avoids this and is better for it. For Those Who Can Tell No Tales is intriguing, but doesn't quite fit into the category of a drama due to it's lack of emotion. It serves the purpose more as a very good piece of travel fiction for the screen that deals with horrors of a past war and how a community moves on from such a dark past.